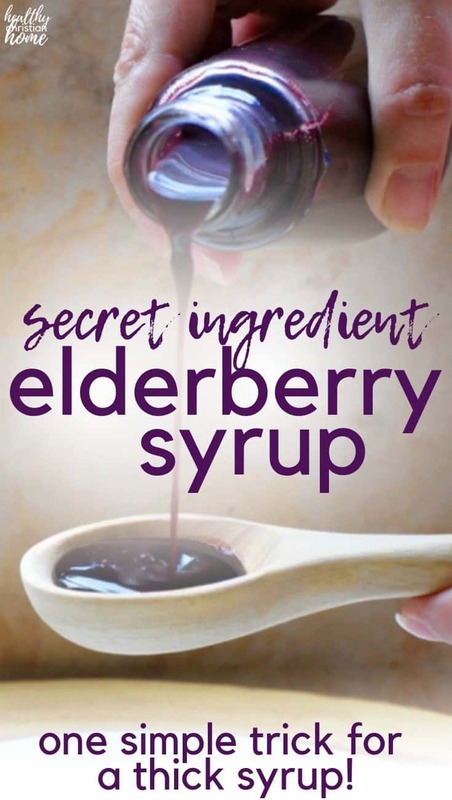 It’s no secret – our family loves elderberry syrup. 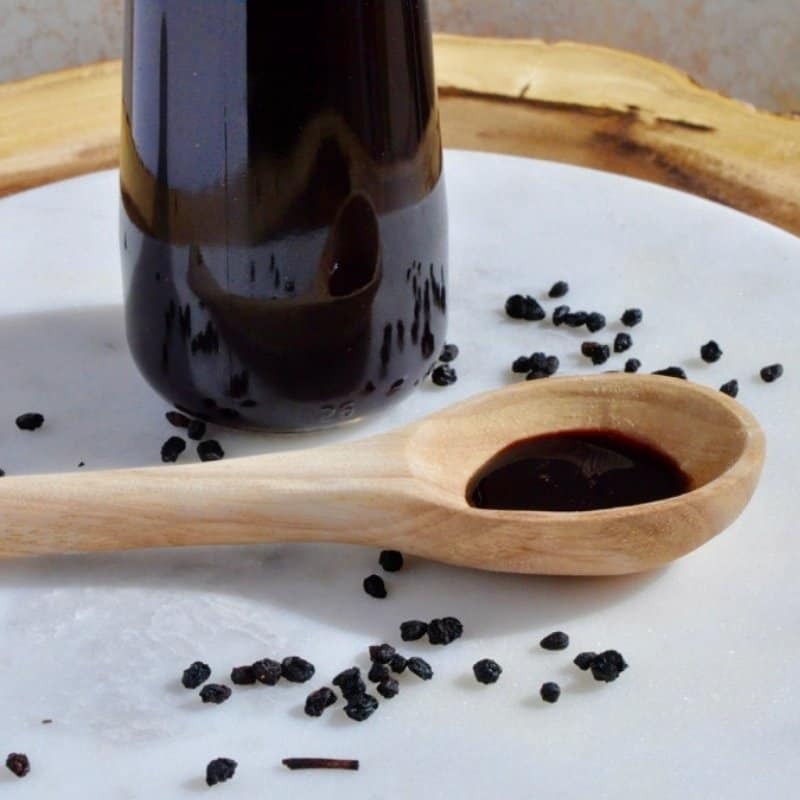 And this love affair goes even deeper now that we’ve perfected this thick elderberry syrup recipe that’s easy to pour. It’s the same nutritional profile and cold-fighting power in a thicker formula! This year, our family is trying a new experiment. We are taking elderberry syrup every single day to see if it makes any difference in our number of sick days. Last year, we only took the syrup when we were feeling bad. By then, it was too late and viruses had already taken hold. So far, we’re doing pretty well. Every day after school, I call the kids into the kitchen to take a spoonful of my homemade elderberry syrup. The only problem is, I have to keep a towel handy. Because every single day, without fail, I get elderberry drips on my white linoleum floor. Because the term “elderberry syrup” is a bit misleading. Sure, it’s full of healthy cold and flu fighting compounds and tastes great. But, it’s not exactly syrup. 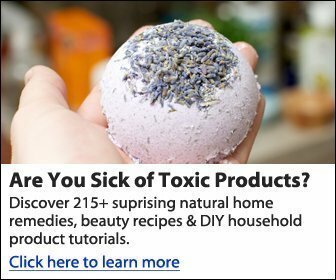 At least, not the homemade recipes I’ve tried. More like elderberry juice. Which is perfectly fine, if you don’t mind the inevitable spillage as you pour the elderberry concoction onto your spoon and try to transport said spoon into your child’s mouth. Unless you have Jedi balancing skills, your floor is getting messy. It took some trial and error, but after experimenting in the kitchen this weekend I’ve come up with the perfect thick elderberry syrup recipe. 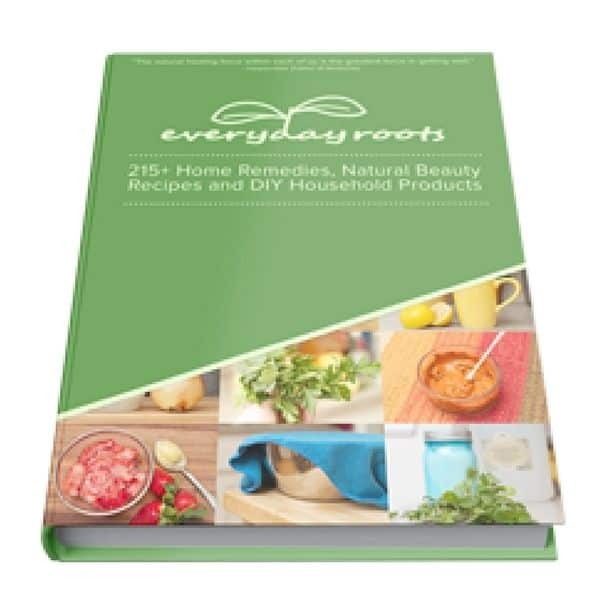 Dried Elderberries – Immune system stimulators with vitamins A, B, and C. You can source them on Amazon, Vitacost, and other websites as well as certain health food stores. Hurry and grab some – stores usually sell out in the wintertime and hike up their prices! Filtered Water – This doesn’t make or break the recipe, but we love using our Berkey filter because it filters out 99% of all contaminants better than generic filters at only 2 cents per gallon. Local or Manuka Honey – Honey sweetens this syrup and contains enzymes, antioxidants, and antibacterial properties to help your body fight illness. I like using a mix of raw local (Alabama) honey and manuka (New Zealand) honey. Raw honey is best because it retains more beneficial properties than heated honey. Arrowroot Powder – this serves as a thickener for this recipe. Entirely gluten free, arrowroot is a starchy tuber from Central America. 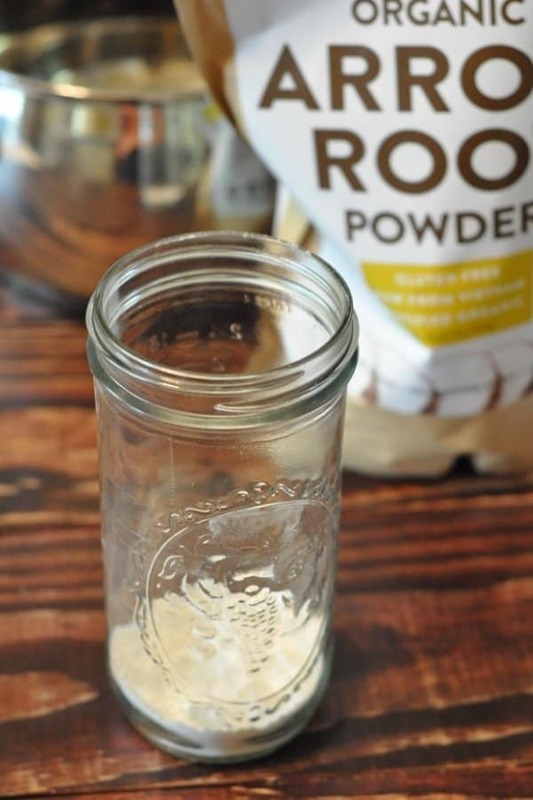 Apparently, arrowroot powder is also an immune system booster, making this cold and flu fighter even more potent! It also contains B vitamins, iron, and potassium according to Downshiftology. You can find it here. 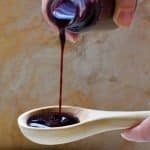 For in-depth information on the benefits of elderberry syrup and the price of homemade vs. store bought, read this post. Dosage: For prevention, 1 teaspoon 1-2 times daily. For illness, 1-3 teaspoons up to 4 times daily. Use the smaller dose for children and a bigger dose for adults. I actually made one batch of syrup using ground chia seeds as a thickener instead of arrowroot. The final result was good! However, I went with arrowroot because it has a more polished finish and the chia adds a bit of graininess. Also, I don’t think the chia version would last as long in the fridge, and it changes the taste slightly. But my boys still really like it! If you don’t have arrowroot on hand, this is a good option. Just use half the amount of ground chia to substitute arrowroot. If you want to add a little something ‘extra’ to your syrup, try adding a cinnamon stick, fresh ginger, and a couple of cloves to your berries while they simmer. I like to store the finished syrup in the 4 ounce small mason jars. They freeze really well and are great to give as gifts or even sell during flu season! 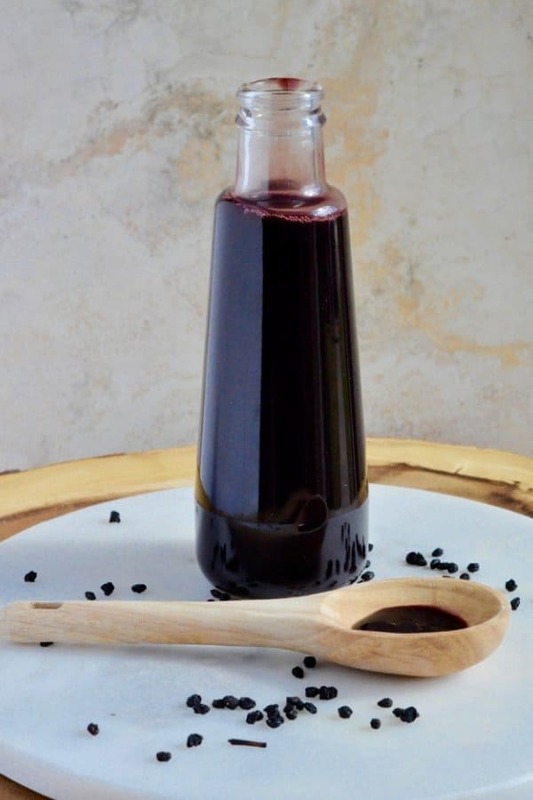 A thick elderberry syrup recipe for easy pouring, with all the same immune boosting properties you need! 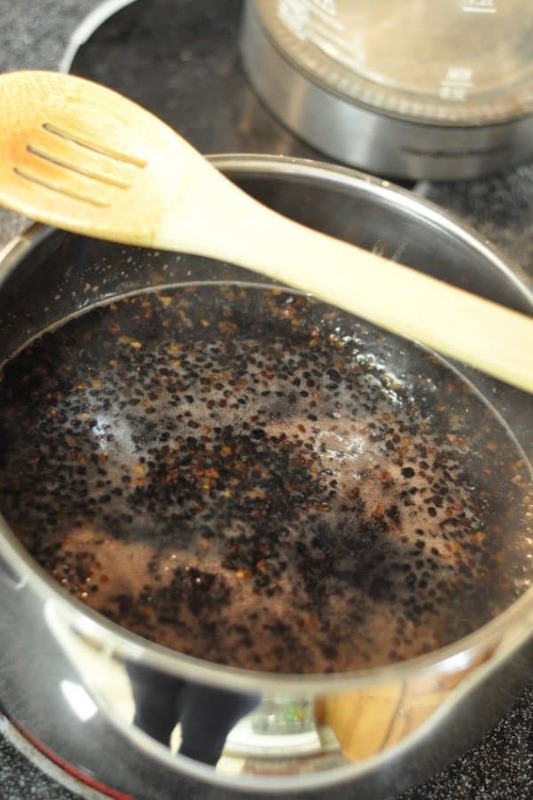 Combine elderberries and 3 cups of water in a large pot. Bring to a boil and stir; reduce heat and allow to simmer for 30 minutes. Put the lid on the pot so all your liquid doesn’t boil out. Allow mixture to cool. Strain through a mesh strainer or cheesecloth into a large bowl, making sure to squeeze and get all the elderberry goodness out. Add arrowroot slurry to simmering elderberry liquid. Heat for several minutes and whisk until mixture begins to thicken. You can adjust the amount of arrowroot to your desired thickness. Once elderberry liquid is completely cool, add honey and mix well. Syrup keeps in the freezer for 6 months and the fridge for 3 weeks. If you enjoy this recipe, would you mind leaving a recipe rating in the comments section? I’d really appreciate it! Not keen on making your own? 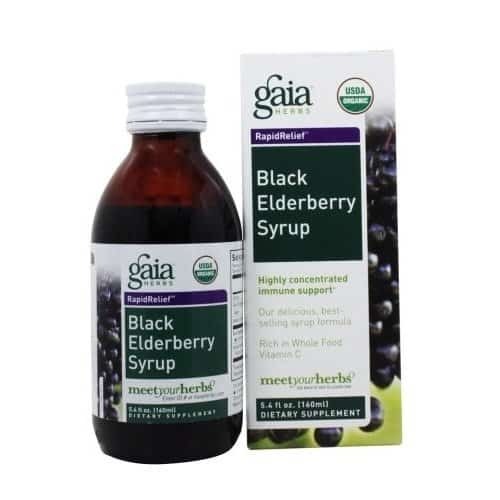 I recommend Gaia Herbs Black Elderberry Syrup for superior quality. 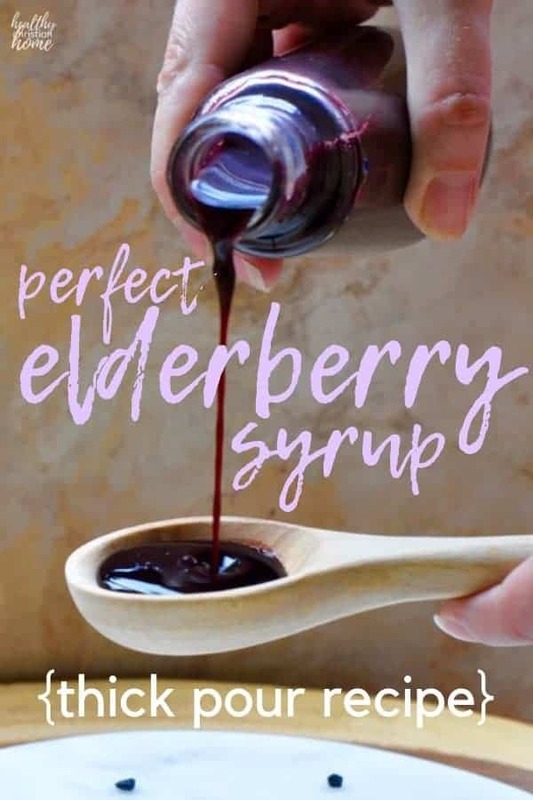 Have you ever tried elderberry syrup? What did you think? Thank you for your recipe! Do you think that one could also use tapioca starch as a thickener with the same success? Hi Cara! I’ve never used tapioca starch before, so I’m not sure if it would work. If you try it, please do tell me how it goes! 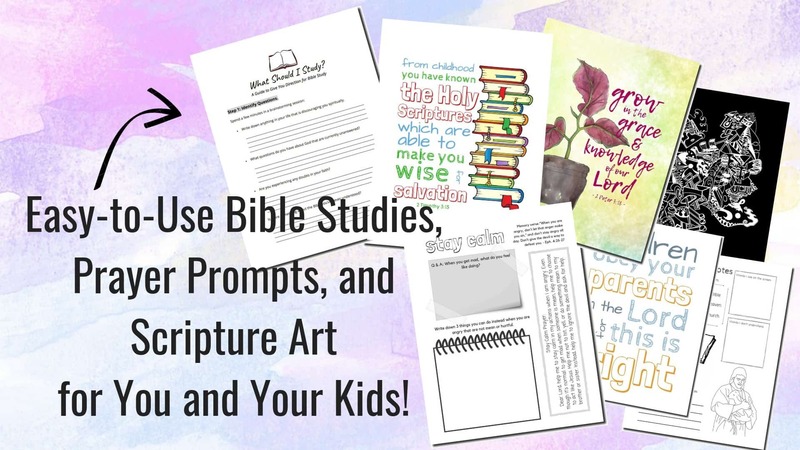 I’d love to add your experience to the post! In the future I may also try an organic cornstarch to give people options. Is there anything that can be used to make this syrup last longer in the refrigerator? Not that I know of. But, you can freeze the syrup until needed and it thaws fairly quickly. I really need to make some elderberry syrup. A friend of mine in another state makes it and all her neighbors swear by it! Definitely, Natasha! It is SO easy. Hi, Do you know I I can substitute corn starch for the thickener? I’m trying to avoid a trip to the market, lol, lol. Hi Sharisse, I really think it will work great! I haven’t tried it personally, but arrowroot and cornstarch are often interchangeable in recipes. Let me know if you try it and add your experience in the comments! Hi, just made this recipe. 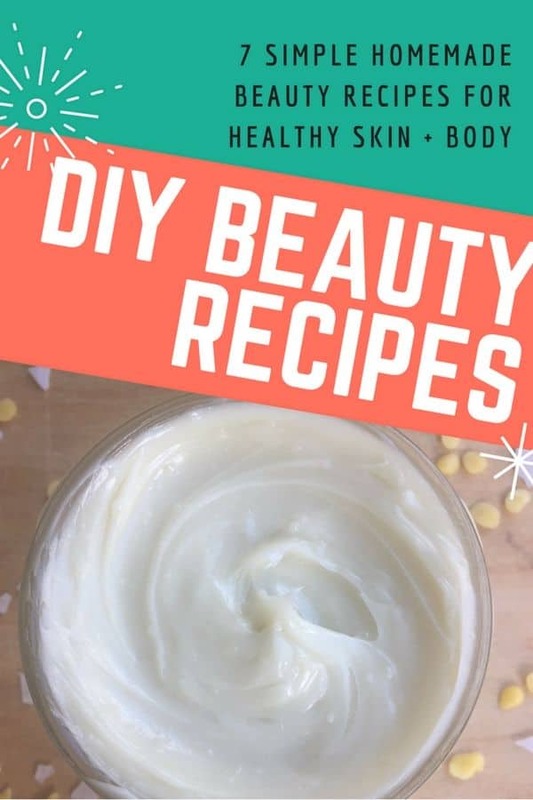 My only question is the amount of arrowroot powder …I think 3/4 cup is to much I put 1/2 cup and it was almost solid and I had to add a little more water to thin it down. That being said the syrup taste amazing thank you for the recipe. Thank you for the tip, Katrina! I will double check the recipe. I’ve been searching for a “thicker” consistency and was excited to see your recipe! I just tried the recipe and I had issues with the arrowroot powder clumping. It never fully disolvrd so I ended up straining it. The consistency wasn’t as thick as I had hoped for. Is a better way to add the powder? Hi Julia! Hmmm, I’m not sure what went wrong. It works great for us! Was your arrowroot powder fresh? Did you simmer the liquid and whisk continuously while adding the arrowroot? Also, did you whisk over the heat for several minutes while the syrup was thickening? That should have gotten rid of all the clumps. Sorry it didn’t work for you! If you try again with success, I’d really appreciate you updating the recipe rating <3 God bless! Julia, after reading your experience I made the syrup again. The same thing happened to me with the mixture being lumpy! I don’t know why this didn’t happen to me the first time; perhaps I added it more slowly? Anyway, I’ve changed the recipe to make an arrowroot “slurry” with water, which is then added to the elderberry liquid. It should help ensure the syrup stays smooth. Thank you so much for your feedback and helping me improve this recipe! Can we can the syrup instead of freeze??? I’m pretty sure you could! I still haven’t learned how to can, so if you try it is love to hear your results! What would you do if you had powdered elderberry instead of the berries? Hmmm, I’ve never used powdered elderberry before so I’m not sure how to advise you. Maybe just sub it for the dried elderberries and see what happens? Is there a conversion chart on the label that says how much powdered can sub for dried?